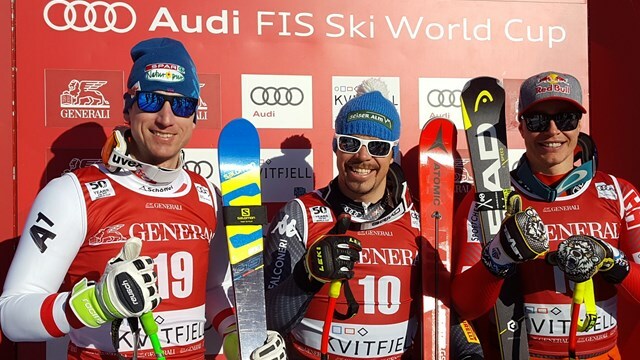 Kvitfjell, Norway – Sunday’s Audi FIS Ski World Cup super G victory in Norway was a first for Italian Peter Fill, as Austria’s Hannes Reichelt was second and Canada’s Erik Guay finished third. Sunday’s race closed out the World Cup season’s last regular speed weekend. Despite a prolific career that includes wins in the Kitzbuehel downhill and the downhill Crystal Globe, Fill, 34, finally claimed his first win in his other strong discipline, super G.
Keene, N.Y.’s Tommy Biesemeyer was the top-placed American in 19th. Brennan Rubie (Salt Lake City) finished 33rd, Bryce Bennett (Squaw Valley, Calif.) 34th, Travis Ganong (Squaw Valley, Calif.) 45th and Andrew Weibrecht (Lake Placid, N.Y.) in 47th. Austria’s Marcel Hirscher, who did not race the Kvitfjell speed events, continues to lead the overall World cup standings with 1,275 points. Norway’s Kjetil Jansrud, who was seventh Sunday, moved up to second overall with 871 points. Jansrud also claimed the overall super G standings with 365 points thanks to three consecutive wins at the beginning of the season in Val d’Isère, Val Gardena and Santa Caterina. Whatever happens in the season’s last race in Aspen, Jansrud will collect his third career crystal globe after claiming both the downhill and super G globe in 2015/16. Up next, the men travel to Kranjska Gora, Slovenia for the final two World Cup races of the season, a giant slalom and slalom, March 4-5.